n important commercial centre in Zambia, Ndola lies some 320 kilometers north of Lusaka. It is the gateway to the mineral producing region of the country. Like Lusaka, the development of Ndola has been rapid and extensive. There are many manufacturing industries here, including a major copper refinery. 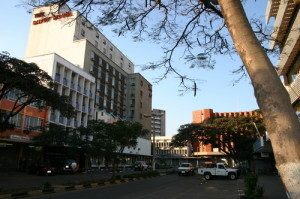 Although copper is still Zambia’s largest foreign exchange earner and the mainstay of the national economy, the city of Ndola has established itself as a commercial and light industrial centre of considerable importance, as well as being the junction and distribution centre for the Copperbelt complex. The oil pipeline from Dar-es-Salaam in Tanzania ends its 1700 km journey at the Ndola refinery. Modern factories, offices and shops line the Central Business District A big attraction in Ndola is the annual Zambia International Trade Fair in July. A number of newspapers and journals are printed in the city, two of which serve the country – the Times of Zambia and the Sunday Times.